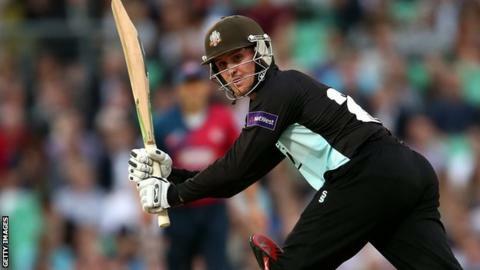 Surrey captain Gary Wilson says his prolific team-mate Jason Roy can lead the team to the T20 Blast title. Opener Roy, 24, has scored 619 runs on the way to Finals Day at Edgbaston with an average of 47.62 and strike rate of 152.46. "It's been fantastic for me as captain to rely on him in all forms of cricket really," Wilson told BBC London. "I don't believe there is a better player than Jason in England at the minute in T20 cricket." Surrey take on hosts Birmingham Bears in their semi-final on Saturday with the winner taking on either Hampshire on Lancashire in the title decider later that day. Roy, who featured for the England Lions in the recent limited-over triangular series, is also Surrey's leading run-maker in the County Championship with 839 at an average of 52.44. "He has been brilliant for us this season," said Wilson. "He has really had a breakthrough year in Championship cricket and we've always known he can do it in one-day cricket." Roy is determined to continue his form on Finals Day, having scored eight half-centuries in 14 matches in the competition this season. "That is the day you want to turn it on really," said Roy. "It all counts for nothing if I go there and don't perform. Fingers crossed I can stick to my form and win a couple of games for us." Roy struggled on Finals Day last year, scoring only five runs in Surrey's semi-final win over Hampshire and 13 in their final defeat against Northants. "We were there last year, we know what it is about," said Roy. "A few of us were in that final, we know the disappointment. Let's hope we can get across the line. It is huge motivation."